There exists a generic system to show users that an action was performed successfully, or more importantly, failed. This system is known as "flash messages". The screenshot below shows the various severity levels of messages that can be emitted. Notifications are used to show very low severity information. Such information usually is so unimportant that it can be left out, unless running in some kind of debug mode. Information messages are to give the user some information that might be good to know. OK messages are to signal a user about a successfully executed action. Warning messages show a user that some action might be dangerous, cause trouble or might have partially failed. Error messages are to signal failed actions, security issues, errors and the like. The fourth parameter passed to the constructor is a flag that indicates whether the message should be stored in the session or not (the default is not). Storage in the session should be used if you need the message to be still present after a redirection. In backend modules you can then make that message appear on top of the module after a page refresh or the rendering of the next page request or render it on your own where ever you want. 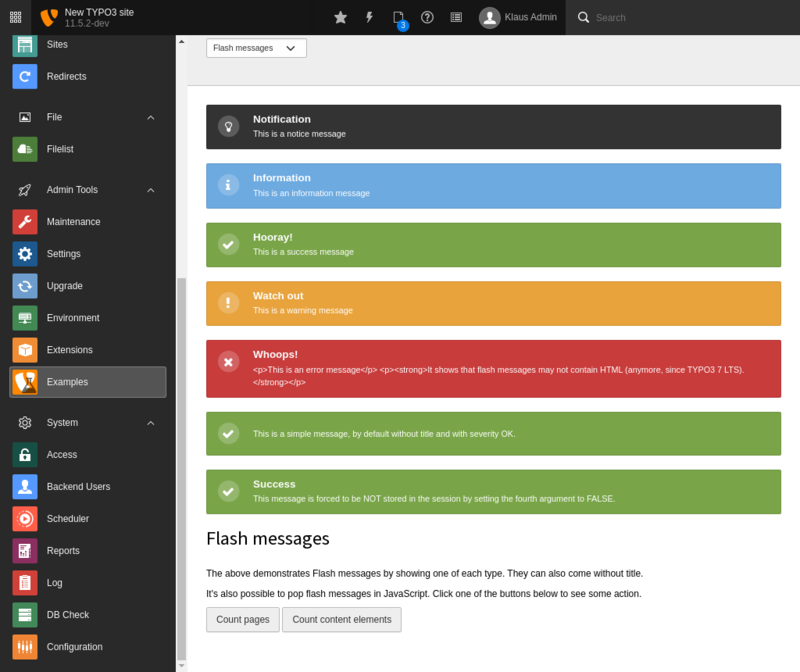 By default flash messages are shown atop the content of a module. However, if needed, you can change where the messages are shown by manipulating a module's template and inserting the ###FLASHMESSAGES### marker. 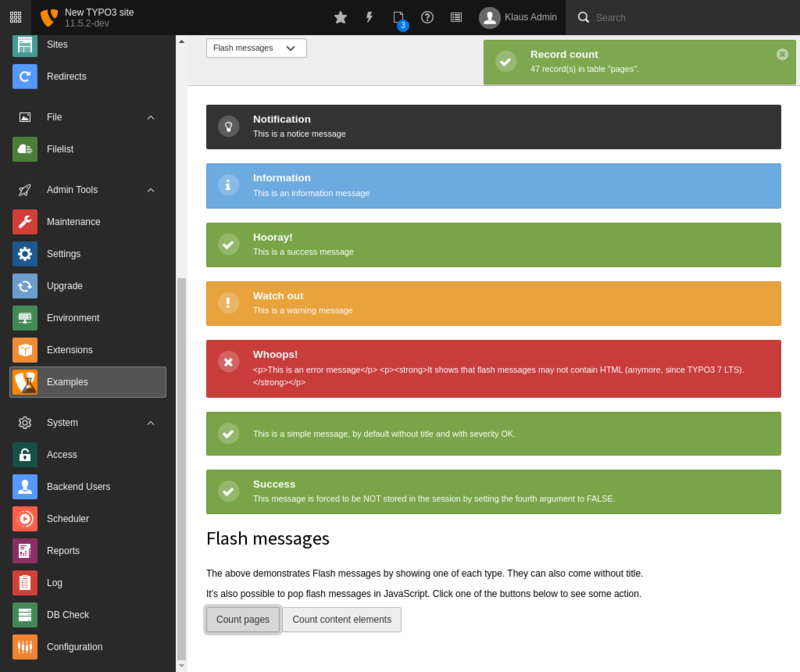 Messages will then replace that marker instead of appearing at the top of the module. The recommend way is to use the fluid ViewHelper <f:flashMessages />. This ViewHelper works in any context because it use the FlashMessageRendererResolver class to find the correct renderer for the current context. The implementation of rendering FlashMessages in the core has been optimized. Where to display the flash messages in an Extbase-based BE module is as simple as moving the View Helper around. The last parameter is the duration (in seconds) after which the message should fade out. 0 = sticky, means it will only disappears on user interaction.